Lebanon is a small, middle-income country, with a population of about 4,350,000, including 400,000 Palestine refugees and a long history of civil war and political unrest. Following the Syrian crisis, the total resident population suddenly increased due to the influx of displaced persons and reached a high of more than 30% in 2013. This demographic change has contributed to the overstraining of the health system with increased utilization of services and a surge in demand for non-communicable diseases services, including mental health.1 This has widened the gap in mental health services already available due to the chronic under-funding and the inclination of funding towards curative hospital-based care. Vision: All people living in Lebanon will have the opportunity to enjoy the best possible mental health and wellbeing. Mission: To ensure the development of a sustainable mental health system that guarantees the provision and universal accessibility of high quality mental health curative and preventive services through a cost-effective, evidence-based and multidisciplinary approach, with an emphasis on community involvement, continuum of care, human rights, and cultural relevance. Values and guiding principles: Autonomy, Dignity, Participation, Empowerment, Accountability and integrity, Quality. In addition, to coordinate the MHPSS response to the Syrian crisis, the MOPH established and is currently chairing with WHO and UNICEF the Mental Health and Psychosocial Support Task Force (MHPSS TF). This task force currently includes more than 60 organizations working on the Syrian crisis response in Lebanon with the aim of harmonizing and mainstreaming MHPSS in all sectors and improving access to care. An action plan for the MHPSS TF is set every year to address challenges faced in MHPSS work. A priority of the 2016 action plan is the development of a national inter-sectoral referral system linking all levels of care, with a main focus on mental health, protection and shelter. The “Mental Health and Substance Use Strategy for Lebanon 2015-2020” aims at building a sustainable mental health system for all persons living in Lebanon and not exclusively for the Lebanese. Vulnerable groups to mental health disorders and human rights violations (e.g. Displaced populations, persons in prisons, survivors of torture, families of the disappeared, LGBT community and foreign domestic workers) were identified as target groups for tailored interventions. The strategy is built around cost-effective interventions recommended by the WHO but a local cost estimation has not been conducted yet. Despite the absence of a preliminary budget, “opportunity planning” was conducted and the Strategy was developed and launched as an evidence-based roadmap with cost-effective interventions. Detailed implementation plans with costing are developed for specific strategic objectives upon availability of opportunities for funding. For instance, the implementation of the strategic objective “Adapt and pilot an e-mental health guided self-help programme for Lebanon”, which was targeted to be achieved in 2019, began in 2016 upon an opportunity of collaboration with Fondation d’Harcourt and WHO on its implementation. An eﬀective coordination mechanism, the MHPSS TF, between 62 organizations including the MoPH, UN agencies, and national and international NGOs, was built and is expanding further. Today, the MHPSS TF provides a platform for developing annual action plans that address the challenges faced by all actors on the ground. 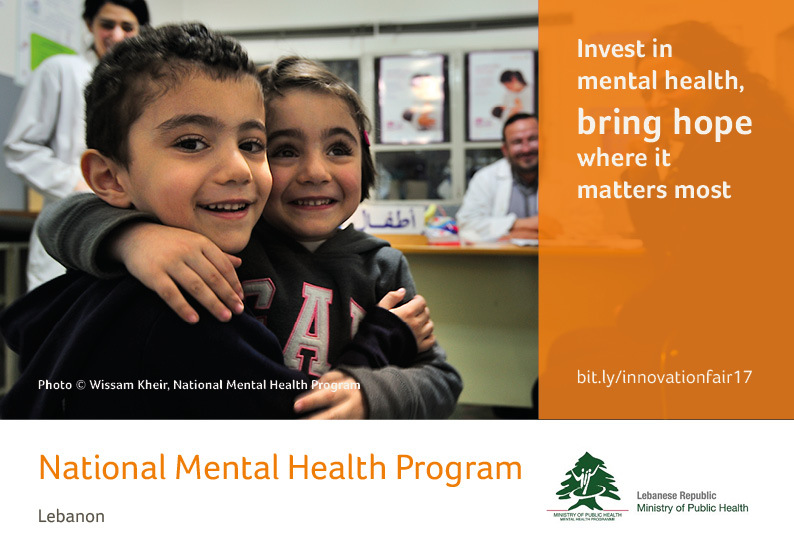 The NMHP was successfully established, aiming to ensure the development of a system that can swiftly respond to the mental health needs of the Lebanese and other nationalities living in Lebanon. The strategy launched by the programme and its partners now constitutes a roadmap to promote the allocation of resources based on evidence and through consensus among all stakeholders. Based on the roadmap, strategic objectives are planned in five domains of action, including seven cost-effective and evidence-based strategic interventions. Building of links between the MHPSS, Protection and Shelter clusters to complement and align actions towards the development of a national inter-sectoral referral system and the integration of mental health into protection programming. Ministry of Public Health. 2015. Mental Health and Substance Use- Prevention, Promotion, and Treatment- Situation Analysis and Strategy for Lebanon 2015-2020. Beirut: Lebanon. UNICEF, MoPH, UNRWA and IRC. 2015. Providing Community Based Psychosocial Support Through A Systems Strengthening Approach: The Lebanon Case Study. Lebanon's newly released National Mental Health Strategy advocating for evidence based practice, provision of optimal services and change in attitudes towards mental health and substance use.